What’s Your Style – Dance Nights – The Big Sky Centre for Learning and Being Astonished Inc.
Everyone should have the opportunity to let loose and dance in whatever way the music moves them, regardless of musical taste, dance style or ability. The City of Regina, First Steps Wellness, and Astonished! 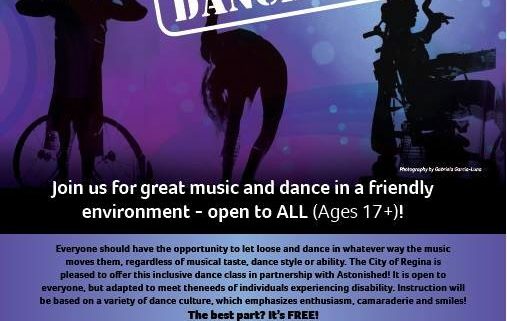 are teaming together to offer this inclusive dance class, open to everyone, but adapted to meet the needs of individuals experiencing disability. Instruction will be based on a variety of dance culture, which emphasizes enthusiasm, camaraderie and smiles! Please e-mail Katherine to confirm and let her know your Paratransit details.